Medical device innovation is an exciting investment arena. As you have heard many, many times from team Vestact over the years, we believe that rising incomes, widespread medical insurance and longer lifespans, means more spending on healthcare. We own Stryker for clients in New York, as they have more involvement in hips, knees and spinal "spare parts", but another very credible company in the same industry is Abbott Laboratories. 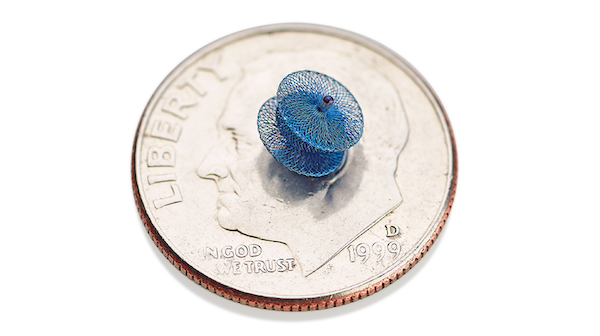 This week Abbott received approval from the US Federal Drug Administration (FDA) for a tiny device called the Amplatzer Piccolo Occluder, which is used to seal small holes in the hearts of premature babies. The picture below shows how small it is, against a coin. I was not aware of this, but everyone is born with a small hole in their heart. In the womb, the hole allows a fetus's blood to bypass the lungs and get oxygenated blood directly from the mother. Usually, the hole closes a few days after delivery. In some premature newborns, however, it never does, making breathing difficult and leading to a host of potential complications. The device can also be used in babies weighing less than one kilogram. It is threaded into the heart using a catheter that runs through the femoral vein in the thigh, avoiding taxing surgery. Well done!